New England Ropes "Vintage" 3-Strand Polyester Line - 1/4"
Note: Working Loads: No blanket safe working load (SWL) recommendations can be made for any line because SWL's must be calculated based on application, conditions of use, and potential danger to personnel among other considerations. It is recommended that the end user establish working loads and safety factors based on best practices established by the end user's industry; by professional judgment and personal experience; and after thorough assessment of all risks. The SWL is a guideline for the use of a rope in good condition for non-critical applications and should be reduced where life, limb, or valuable property is involved, or in cases of exceptional service such as shock loading, sustained loading, severe vibration, etc. 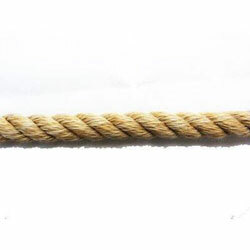 The Cordage Institute specifies that the SWL of a rope shall be determined by Dividing the Minimum Tensile Strength of the rope by a safety factor. The safety factor ranges from 5 to 12 for non-critical uses and is typically set at 15 for life lines. Thimble Size: 1/4", Length: 1-1/2"
Line Diameter: 1/2" to 3/4"
Applications: Splicing Lines from 1/8" to 1-1/2"